After much thought and starting working on my color version I completely deviated from my original path. 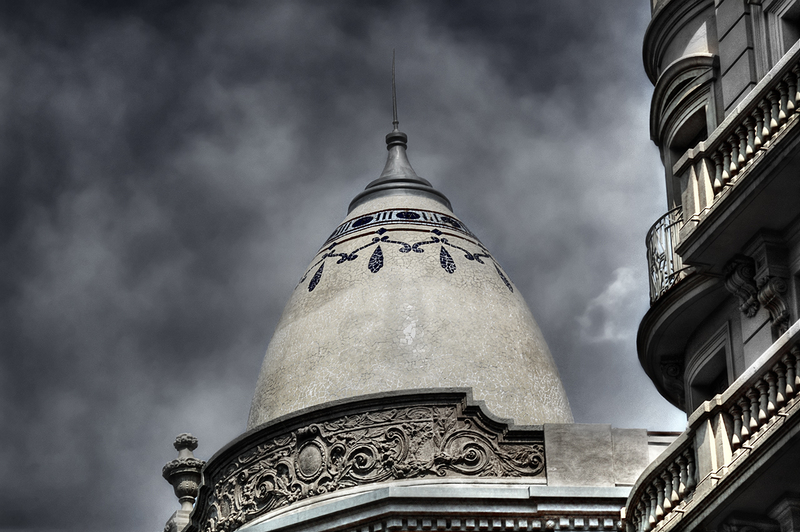 It turned out that the cupola, the one you can admire if you walk along Via Laietana in Barcelona, looked better in black and white, well almost as I finally gave it this bluish touch. The building in fact has two cupolas and occupies a whole block of this heavy traffic street. Very near you have Palau de la Musica. There are plans to build new hotels in this area to which neighbors openly oppose. I have embedded this Google street view map so you can see the building, the cupola on the other side and if you turn left, Palau de la Música, the famous modernist concert hall. Right next to you Casa dels Velers but that's part of another story (Remember you have to click on the map and drag to enjoy the pano or move along the white path by clicking on the arrows). Should you want to see it from above check link here. Una gama tonal excelente. Muy buena. Beautiful processing and great details. Stunning building and love the monochrome effect. Thanks my friends. I will be out for the weekend but don't worry I return on Tuesday.